I thought it might be helpful to put some information up-front about the models and terrain we used. 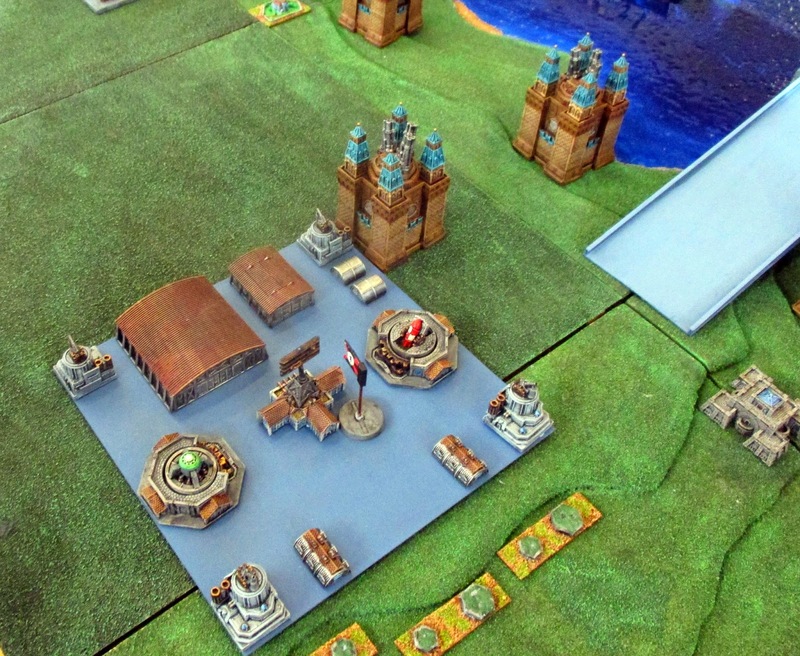 The Chinese Federation models in this report were expertly painted by AJKM, The Russian Coalition (with the sole exception of the fortifications) and PLC Flying models were finished to a very high standard by Dystopian Kiwi. I painted the rest. 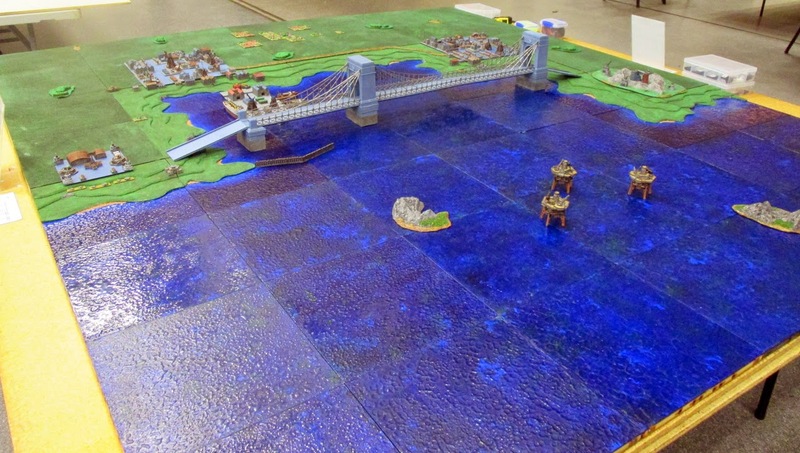 When Dystopian Wars was first released I knew I wanted a terrain solution which allowed for maximum flexibility in a land/air/sea engagement. The board you see is my answer, it’s is a modular system sold by an Australian company which locks each tile together with rare earth magnets on each corner. 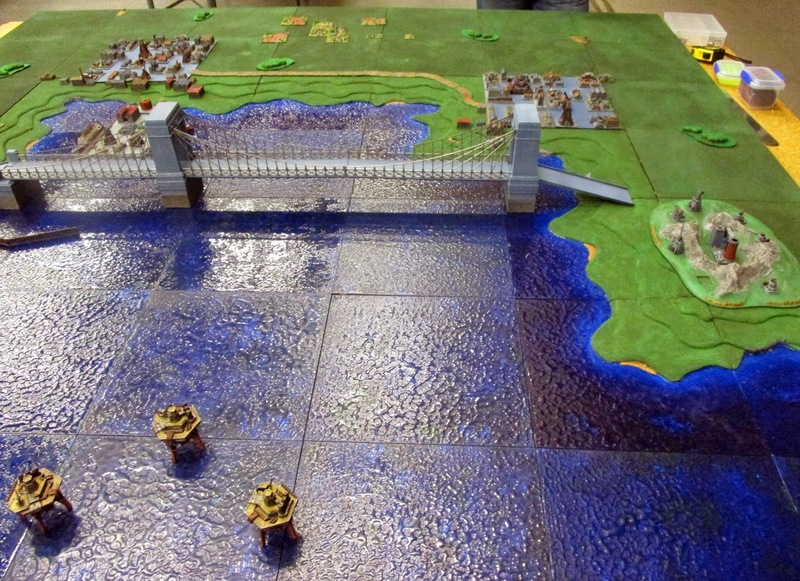 The company sell tiles of multiple heights, and I created the coastline by adding some MDF to build up the edge of the sea tiles, and created the water effect using epoxy resin over a painted surface (following a number of excellent online tutorials) and the land by applying sand and drybrushing. The bulk of the scenery we used for this game is made by Spartan, including the industrial complex, port (which is an amazingly detailed kit – congratulations Spartan! ), fortifications and cityscape. Some of the additions include some 2mm scenery made by Irregular Miniatures which is a pretty near match in my opinion and, of course, the suspension bridge. The bridge is a click-together kit made for 00-gauge model railway use – I added some plastic-card to the base to cover the tracks, cut down the tower bases to reduce the overall height and added some brick tile to texture each caisson, and painted the whole thing. 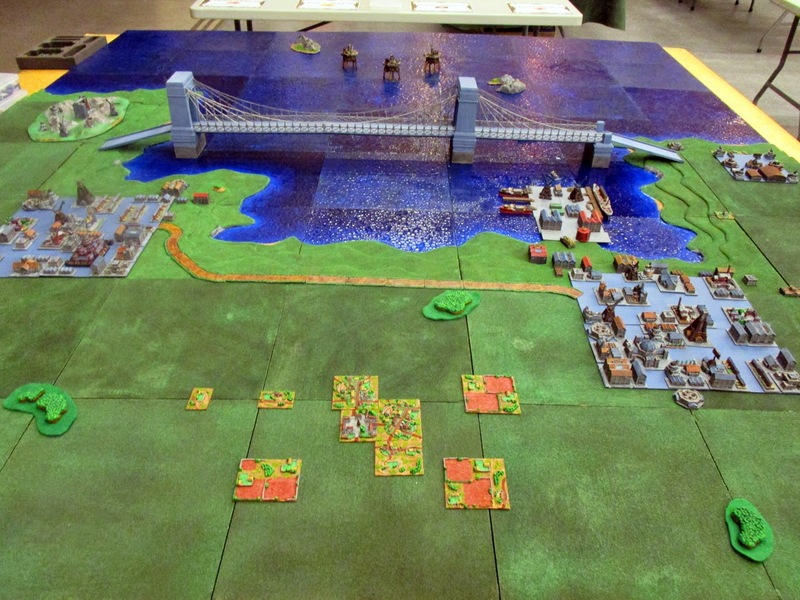 The setup for this game was intended to give each side two ‘safe’ objectives on land that would be defended and three central naval objectives that were not controlled by either side at the beginning of the game to be contested. Because each objective provides a reward for the holder each turn, the rationale was that both sides would seek to contest all the objectives as rapidly as possible, providing an incentive not to just stand back and shoot at the enemy, but also making the decision about which units to send in for an assault more strategic. Because armoured models have a significantly lower speed than most naval models it was also determined that the road and bridge would allow any armoured vehicle to pass over it a movement bonus of +2”, meaning that sending tanks over the road or bridge would have a significant speed bonus. With the advanced deployment rules it seemed viable that both small and medium armoured models could get across the board.